I live in a flat so workshop space is of necessity limited. Fortunately there is only me to worry about so my workshop lives on the breakfast bar in the kitchen. 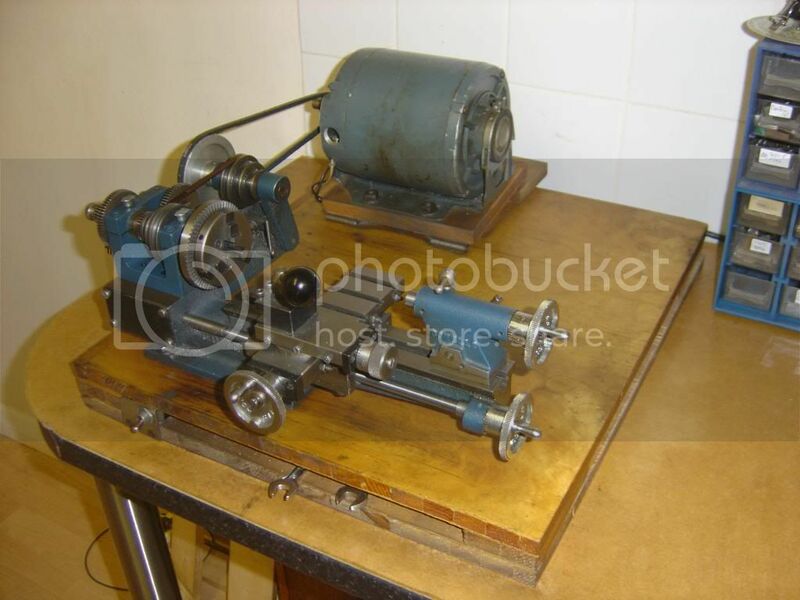 The heart of the workshop, and my only power tool, is a Cowells 90 ME basic lathe. It's a lovely little machine, though I could sometimes do with the fine feed and screw-cutting attachment! One early addition was extra lighting. The lamps themselves had been hanging around for a while looking for something useful to do, and the supports were out of some scrap timber I came across. 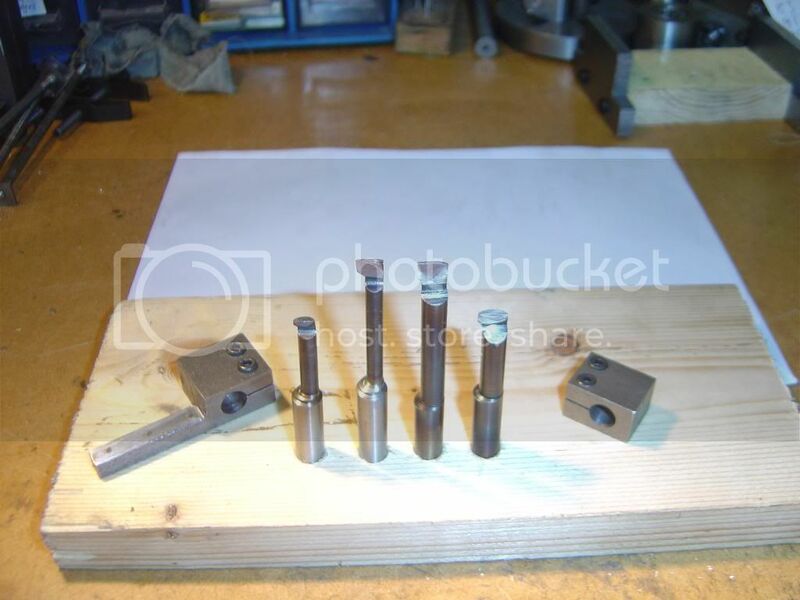 Having no grinder, much of my machining has been done with 1/8" silver steel tool bits in home made holders. 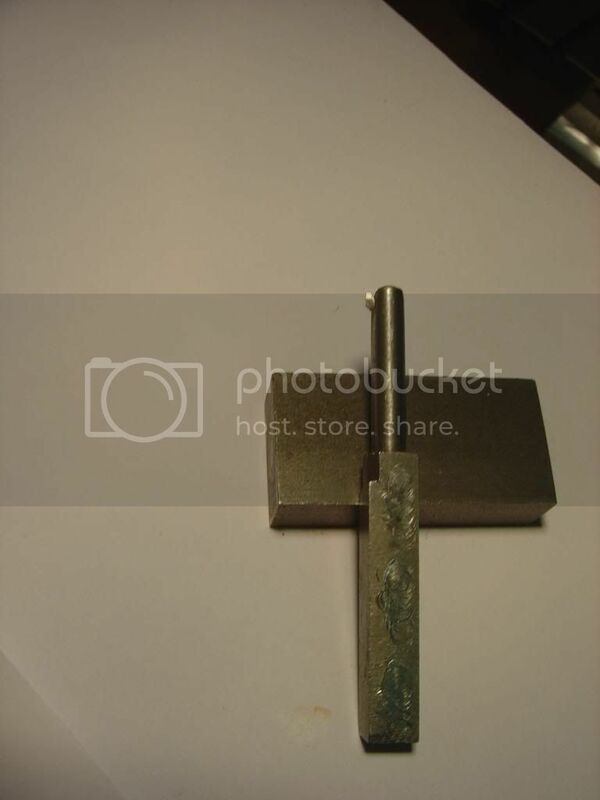 The tool bits are easily formed by file before hardening. 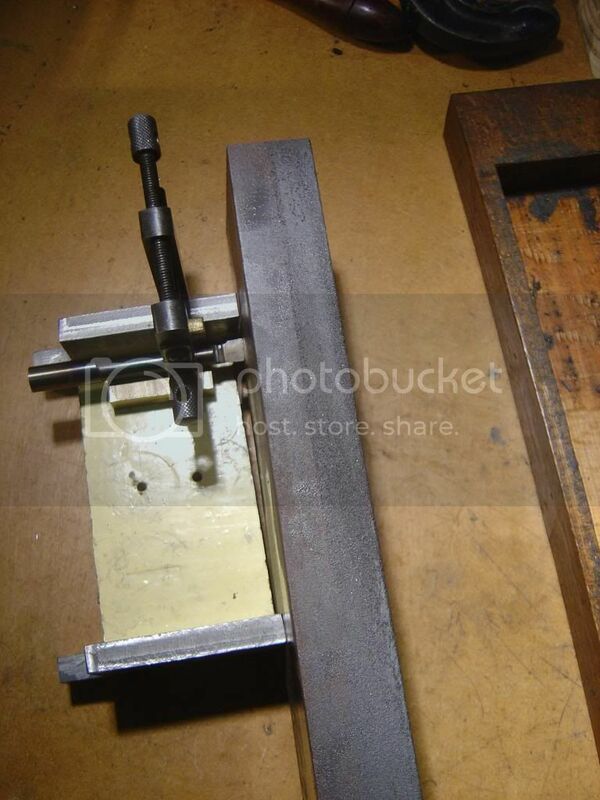 Once tempered the tool bits are sharpened on a stone using a jig made from scrap. 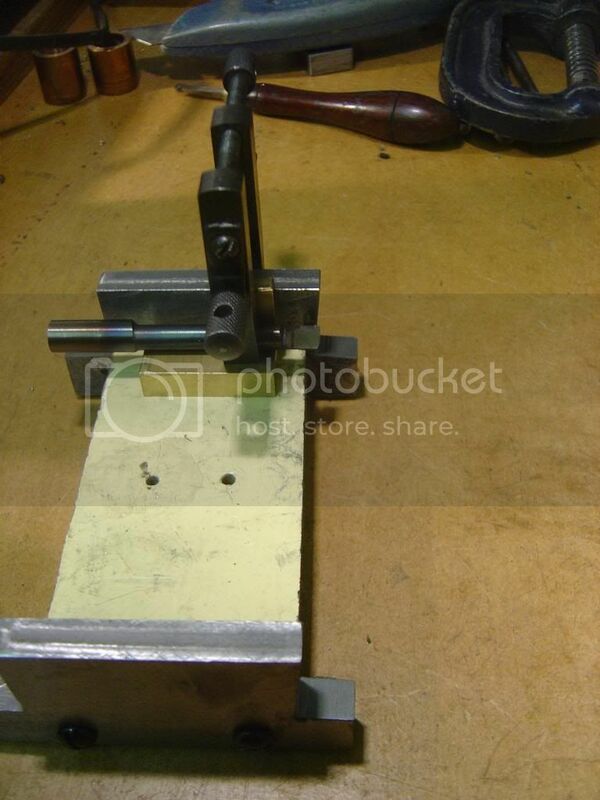 As I don't have a drilling machine, I made up a drill pad for the tailstock. It's been an ambition to be able to mill components held in the chuck, so I made up a milling spindle with overhead drive sitting on top of the lamp supports. 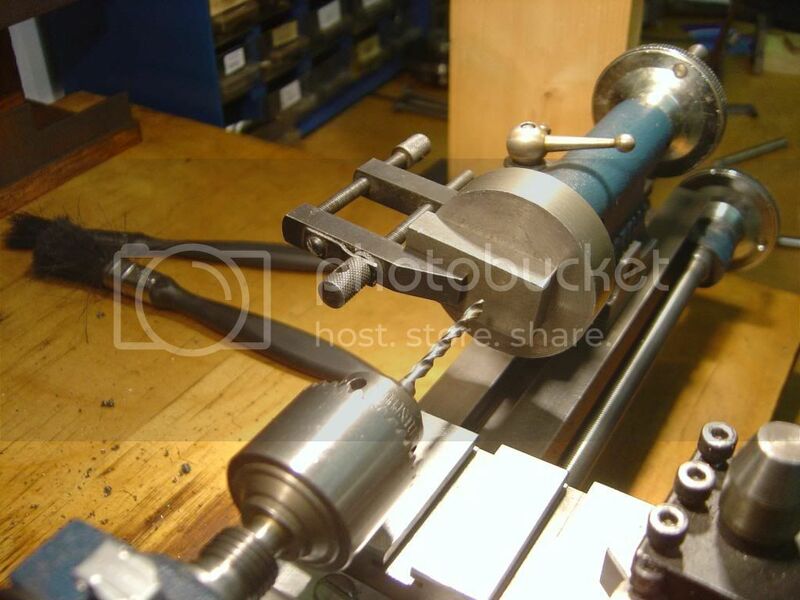 Here we have a closer view of the spindle mounted in the vice on the vertical slide. It was made from the scrap box, with plain cast iron bearings. The shaft was made to suit and lapped in situ. It should last a while! Note the lump of wood under the near-most chuck jaw. This is a basic dividing set up. A weight on the end of a bit of string connected to the chuck key holds the jaw down on to the wooden stop. Three jaws, three divisions. With the wooden stop at the back of the lathe bed I get another 3 divisions. So now I can mill some nuts. Here we see the overhead drive. 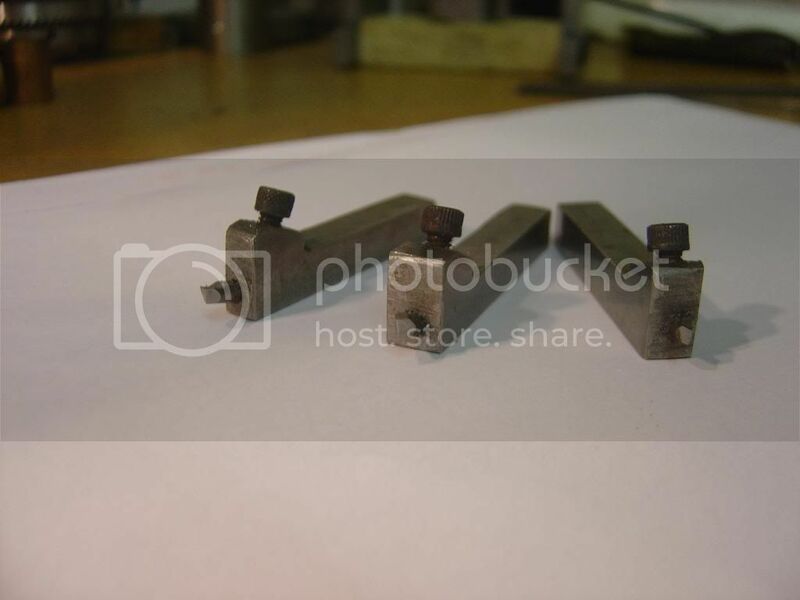 The bearings are off-cuts from some hornblock castings. The wheels can be moved along the shaft and held in place with grub screws onto a flat on the shaft. Note more lumps of wood to support the bearings. Handy material, wood. Well that's about it at the moment. As with every model engineer, a lot of other bits and pieces have been made along the way. 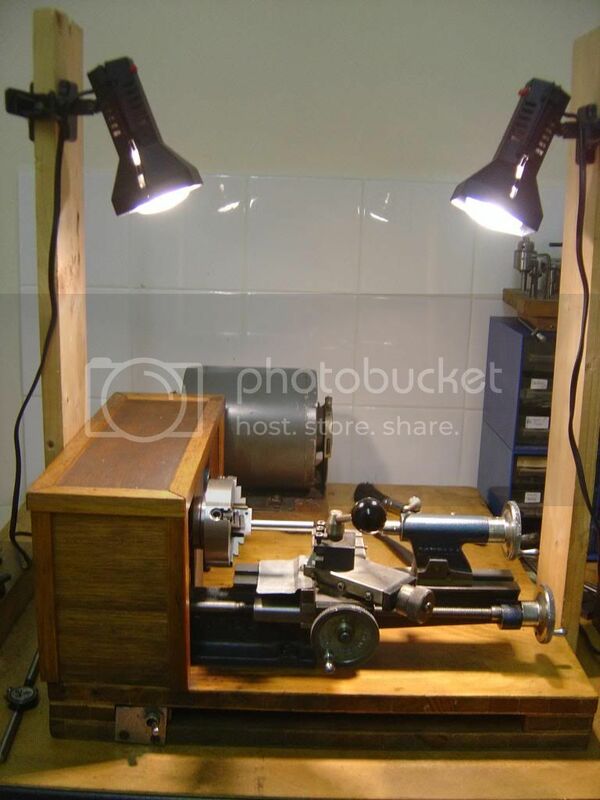 The current project is to build a double ended grinder so I can sharpen tools more efficiently. I've got the wheels and am in the process of building the gubbins to hold them in the right place and turn them round. The grinder will be installed on another demountable "shelf" between the lathe and the overhead drive. And it will be driven from the overhead. There will be a cover for the lathe to keep the grinding dust off the machinery of course. I'm not really sure when I'll get it working. The current struggle has been boring out some anonymous bronze (Admiralty?) from the scrap box for the bearings. 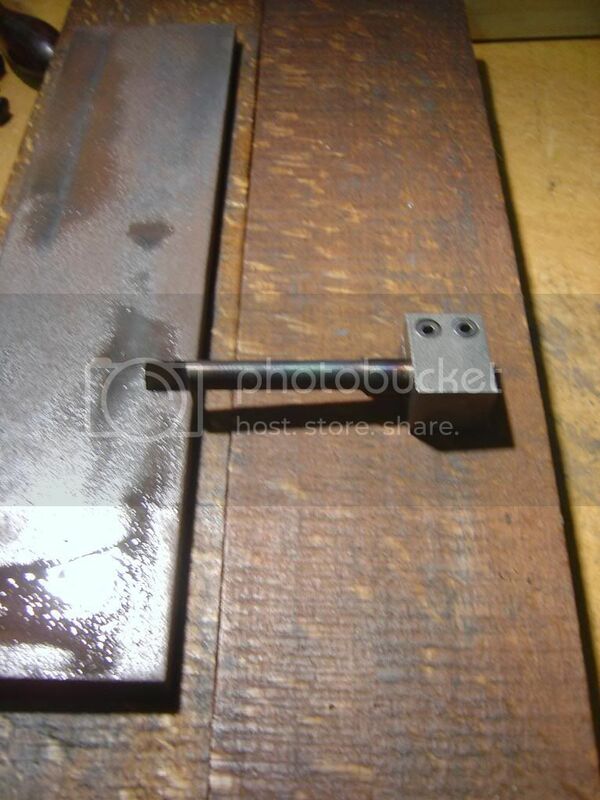 This has caused a detour into boring bars, how to sharpen them, methods of holding them, etc. etc. etc. All jolly good fun! Greetings John, my hat is off you you sir for showing us your ingenious usage of space. It is fascinating to me to see these things. Well done Care to show off some of the projects you have made? You do know that we LOVE pictures. Sorry missed the fact that you did not have the fine feed attachment . 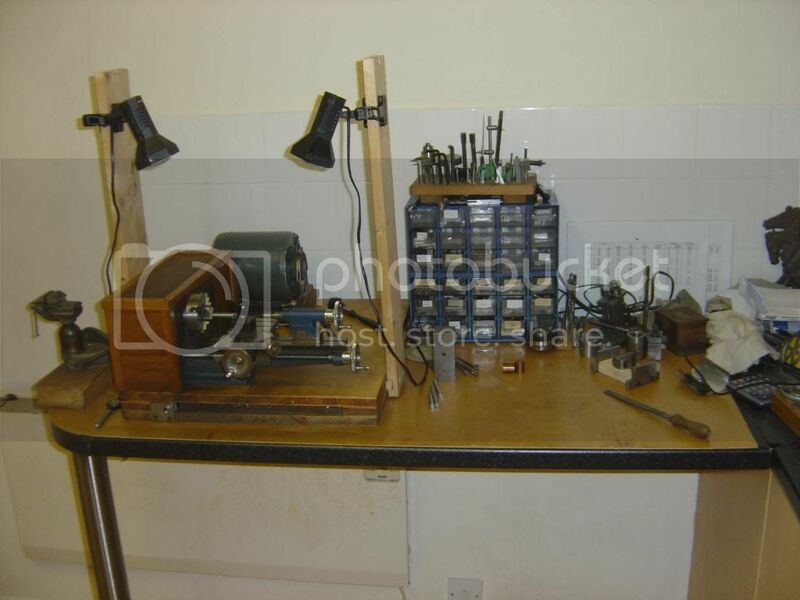 Would you like to knock up some blanks and could visit to use my mill to cut the necessary gears? Great stuff! Where there's a will there's a way. Thanks for the kind comments guys. The workshop gives me a lot of pleasure, and quite some frustration too! But that's not to do with where it's located, more to do with my skill! Thanks for the offer Jo. I have access to a milling machine at the club, but getting the self-act hooked up is not high up the list at the moment. The current job is the grinder so I can spend less time honing. Then I want to arrange for better dividing facilities. That's probably going to be a means of fixing dividing plates to the end of the spindle plus a detent. Lots more fun to be had yet! And guys, I'll post some more pictures when I have something to show. I'm not a rapid worker! Welcome.John, that is quiet a setup you have. Doing all with basic setup is very ingenious. Look forward to seeing some of your work. I do believe you are a genius! What a great setup! Nice setup in a limited space John. But be careful when you fix dinner in that area, you don't want too much iron in your diet. I nominate you, John, for the most efficient shop of the year. Please do show your projects. This is my first boring tool, made some years ago.I made it from some 1/4" square with a toolbit of 1/16" silver steel held in place with a grub screw in the end of the tool holder. It did well enough, but it was not a lot of good for a flat-bottomed hole. On top of which the toolbit disappeared quite quickly on sharpening, which was a fiddle and a bit random. So I made a tool holder for 5/16" tool bits based on a design by George Thomas. The toolbit is again silver steel. 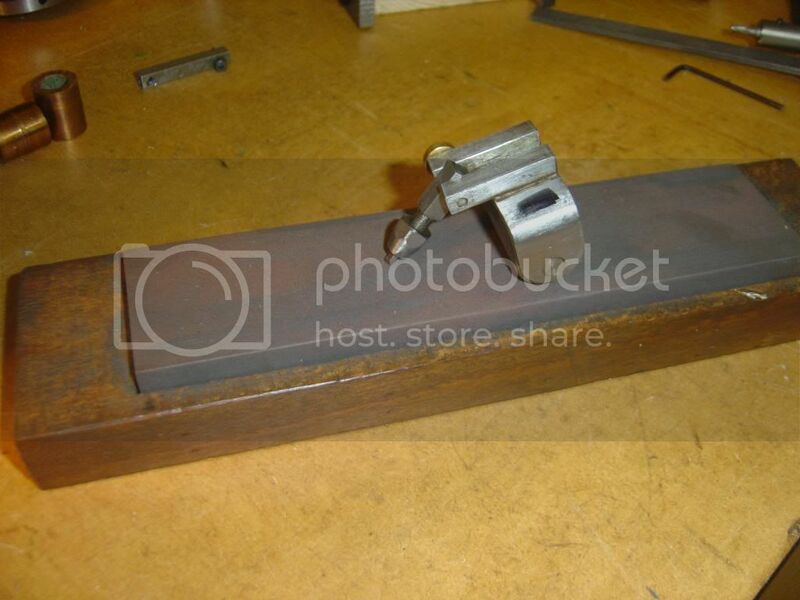 Having made this to shape and hardened and tempered, it just needed to be sharpened. I used a couple of jigs and my trusty stone. The first jig I saw in a book by Ian Bradley. Jo put up a picture of this a couple of months back, but here's another one. It consists of a couple of plates kept apart by a lump of wood. 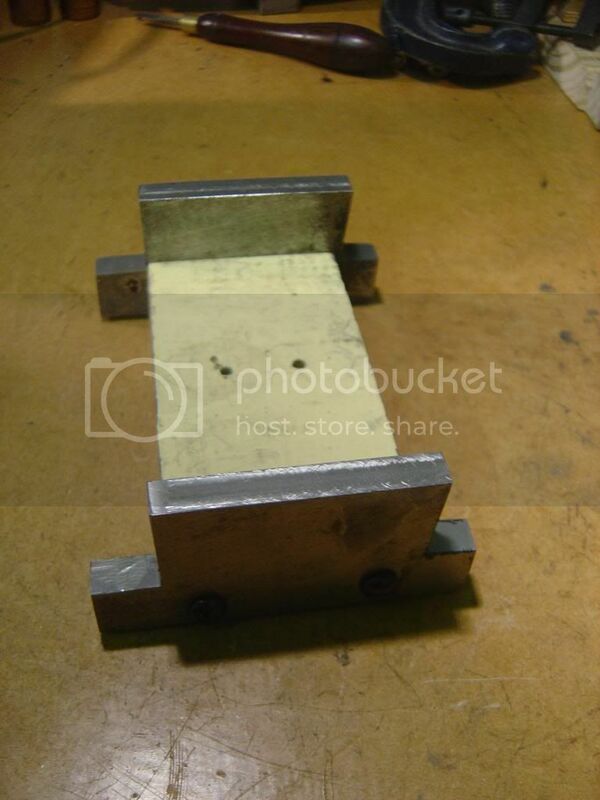 The plates have angles of 6 and 1 degrees so the jig is handy for honing clearance angles. For the boring tools it is handy for the end face, and to do this one the toolbit is clamped to one of the plates with suitable packing. The stone is then run up and down to hone the end. The side is done with the stone horizontal. I have a block which holds the non-business end. 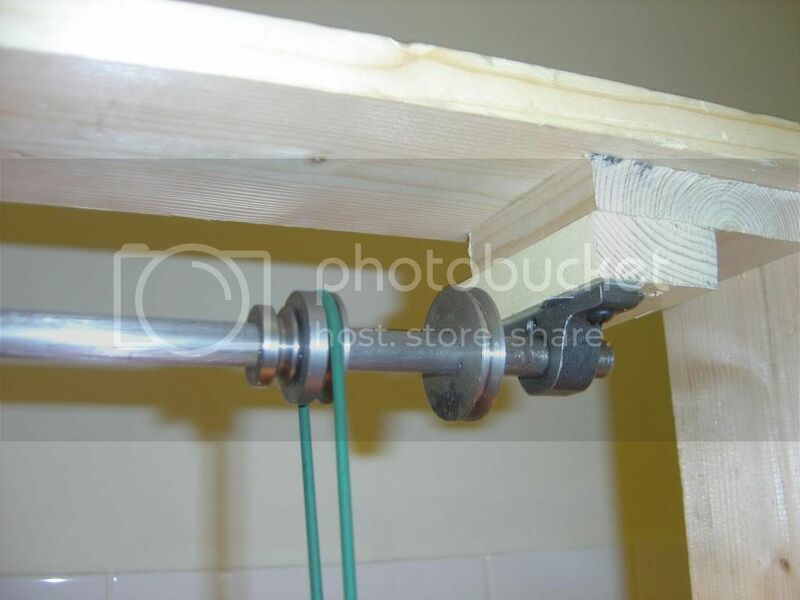 This sits on a suitable support and stops the tool wobbling as it is worked up and down the stone. The same process is used for the top face. And after an hour or so of gentle honing, there's a set of boring tools ready for use. The square block wasn't intended to be a honing jig, though it turned out dead handy for that. 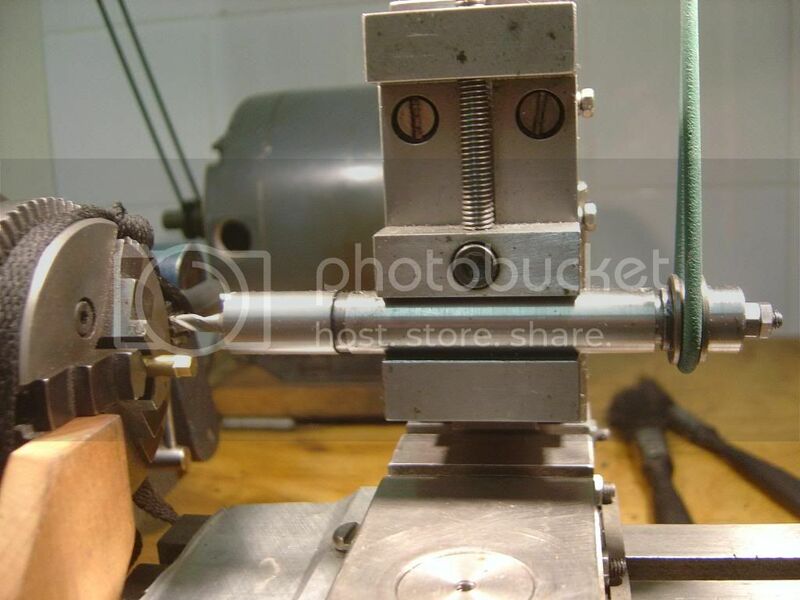 The theory is that it is held in the four-jaw chuck with boring tool inserted to form a poor man's boring head. With a DTI to measure tool movement using the chuck jaws, it might just work. I needed to make a small tool to fit my between centres boring bar. 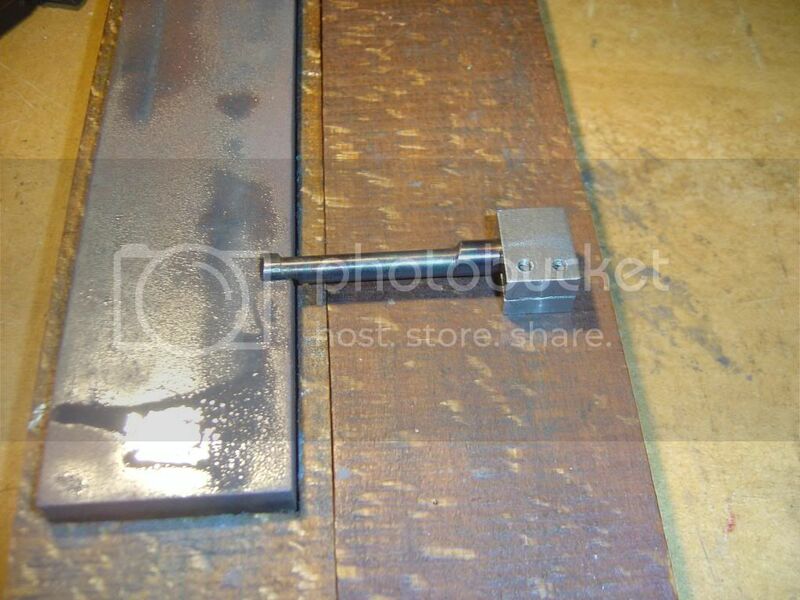 The boring bar is 1/2" diameter, so that was the length of the toolbit. And to continue my normal practice I made it out of 1/8" silver steel. 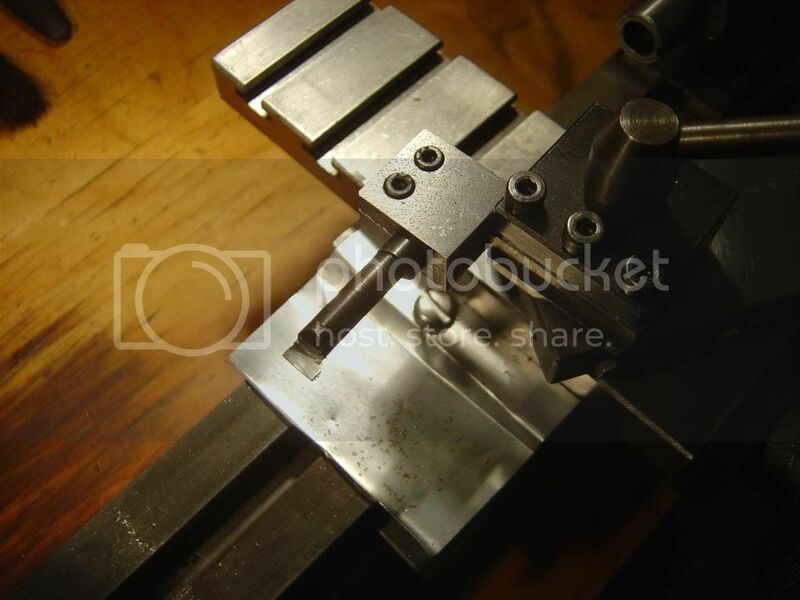 Having filed the business end to approximately the right shape, it then needed hardening and tempering. Hardening is no problem. I have a blow torch in my kitchen cupboard and used a bit of soft iron wire out of one of those ties you get with plastic bags to hold the toolbit. Get it nice and red and drop it in an old tin with water in it conveniently placed under the flame. Then comes tempering. The flame of the blowtorch is a bit fierce. It's meant for scaring off wide boys and toasting the top of the lemon meringue pie, but for watching the colours travel up a 1/2" length of 1/8" silver steel it just wouldn't do. Now somewhere or other (I hope) I've still got a spirit lamp I made up a few years ago from an old salt cellar with a bit of tube in the cap through which came a wick. Unfortunately it doesn't have a place in my kitchen at the moment. So I was a bit stumped. I didn't even have a candle which would probably have done the trick. But then I remembered I was a smoker and had a cigarette lighter in my pocket. So I sacrificed another tie from the plastic bag box, wound it round the blunt end of the toolbit and held it in the flame of my cigarette lighter. Watched the colours run up and dropped it in the tin of water at the appropriate time. Worked a treat. 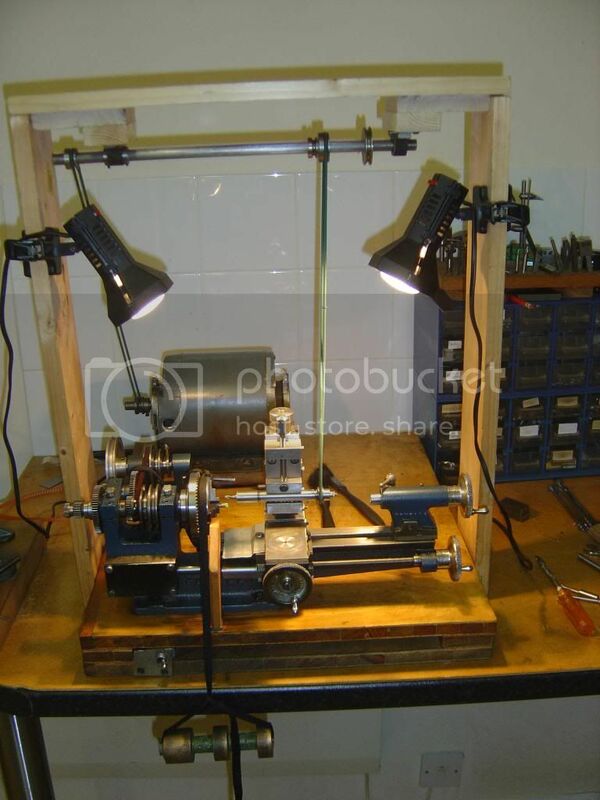 Very nice lathe you have there John, and some ingenious solutions to your tool sharpening needs! a nice touch using George Thomas and Ian Bradley techniques together. Actually I 'carved' my GHT bar out of solid HSS and have been using it tonight to make collars for sharpening saw blades on my Clarkson. Your excellent work therefore only raises on question. Did you mistype the degrees quoted? I made up the Bradley years and years ago and I recall that he gave 5 and 10 degrees whilst GHT gave 7 and TEN rather than 6 and ONE. Yes I used 6 and ONE degrees, based on Tubal Cain's ME Handbook. Particularly as on a lathe this size roughing is a bit optimistic. I must admit I tend to use 6 degrees most of the time and as long as the tool is kept sharp, it does pretty well. PS good luck with the saw blades. Bad Behavior has blocked 15360 access attempts in the last 7 days.